Khayyam, evokes memories of soothing, lilting melodies. Since the late 40s, the veteran composer has done films at his pace - less than one film a year - but oh, what songs he has given us! He got his first independent assignment as a music director in Zia Sarhadi's Foothpath in 1953. The songs of Footpath became very popular especially 'Shaam-e-Gham Ki Kasam..' sung by Talat Mehmood. In the mean time he used to compose numerous non-film songs with C. H. Atma, Mohd. Rafi etc. His songs reflected the traditional ghazal format. He did few more films after Footpath but none of them worked well for him. In 1958 he got Phir Subah Hogi. Its songs were written by Sahir Ludhianvi and they reflected Nehruite politics,e.g, 'Chin-o-Arab Hamaara..' and 'Woh Subah Kabhi To Aayegi..'. In 1961 he came out with Shola Aur Shabnam which was a hit and its songs gain enough popularity for Khaiyyam. Khayyam continues to be one of Hindi film music’s great finds. His house serves as a study in simplicity with relics of all religions and multi-religious ceremonies are a part of his daily life. God, to him, is a single Power. Khayyam was born as Mohammed Zahoor Hashmi in Rahon village in Jalandhar. He was inclined to the music when he was very young.He often escaped to the city for watching movies. Khayyam soon ran away to his uncle’s house in Delhi, in the hope of becoming an actor. Khaiyyam’s uncle enrolled him in a school. When he saw the boy’s passion for films, he allowed him to learn music, since in those days it was actually a step forward in realizing his ambition. He studied music under the guidence of Pandit Amarnath and Pandit Husnlal Bhagatram. After that he went to Lahore looking for roles in films. But fate had something else in store for him. One day Khaiyyam had gone to meet G.A. Chisti one of the foremost music directors when young Khaiyyam who was listening to the composition by Chisti and sung to him its first part . Impressed Chisti gave him an offer of joining him as an assistant.Khayyam assited Chisti for six months and came to Ludiana in 1943. He was only 18 then. Khaiyyam came to Bombay in 1946, and rejoined Chisti.After some time he broke with Chisti and joined his one-time guru Pandit Husnlal Bhagatram who immediately offered him an assignment a duet with Zohrabai Ambalewali in the film Romeo And Juliet. After this he sang with the top singers like Geeta Dutt and Meena Kapoor. His first from the same film was sung by the legend Talat Mahmood.In the post Footpath period, Khaiyyam spent most of his time composing music for private Ghazal albums. Most of the C.H.Atma Ghazals were put to music by the genius. The film Lala Rookh flopped but it served Khaiyyam’s purpose since the film had wonderful music. The Asha-Talat duet ‘Pyaas kuch aur bhi bhadka di jhalak dikhlaa Ke,’ is an evergreen number. His connection with Raj Kapoor in the film Phir Subah Hogi tresulted in seven songs all of them brilliantly composed. Songs like ‘Chino arab hamara’ and ‘Wo subah kabhi to aayegi' classics will remain Khaiyyam’s best works.In 1962 he composed for Shola Aur Shabnam that containing ‘Jeet hi lenge baazi hum tum’ and ‘Aur kuch der thahar’ (Aakhri Khat ) and ‘Pichli yaad bhula do’ in (Mehndi-old). His last movie was Sankalp in the year 1968.Due to shortage of hindi asisgnments he kept himself occupied by composing for private Ghazal albums. There is an exquisite collection of Ghazals penned by Sudarshan and set to music by Khaiyyam. The collection was called Faakir. He lost his freshness and was almost out of the scene till Kabhi Kabhi came out in 1975. It was a re-birth for him and he made a success full came back. Kabhi Kabhi placed him among the league of the top most music directors of that time. After the success of Kabhi Kabhi he got a series of films year by year. He came out with many hits like Shankar Hussain (1977), Trishool (1978), Noori (1979), Chambal Ki Kasam (1979), Thodi Si Bewafai (1980), Dard (1981) and Aahista Aahista (1981). In 1981 he composed the songs of the classic Umraao Jaan. All the songs from Umraao Jaan became very popular and he got immense appreciation from all over the nation. He also got the prestigious National Award for the music of the Umraao Jaan. Beyond the film songs one can judge Khaiyyam's skill and sensibility in his non-film songs and ghazals. He worked with Begum Akhtar, Mukesh, Talat Mehmood, Meena Kumari etc. His wife Jagjit Kaur is also a noted singer and has sung various film as well as non-film songs. 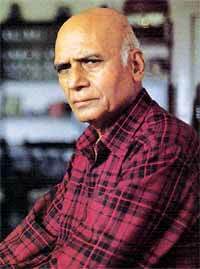 Khayyam became a household name with his songs in Footpath, Mohabbat Issko Kehte Hain, Lala Rukh, Shagun, Shola Aur Shabnam, Aakhri Khat and Phir Subah Hogi. After a hiatus, he made his comeback with Kabhie Kabhie. Yash Chopra thought he was the best choice to compose for a film about the love story of a poet. He was right. Fame has not changed Khayyam. He continues to remain the same humble man he has always been continuing to value original music and lyrics. He hopes that Indian film music will reach the glory of its golden days. We hope so too.